Studies in this week’s Hutchins Roundup find that broad based bailouts are most effective in mitigating financial crises, generous refugee policies are not very economically burdensome, and more. Assessing the interaction between government bailouts and risk buildup prior to a bailout, Javier Bianchi of the Minneapolis Fed finds that bailouts generally have an important stabilizing role. Specifically, a bailout of one percentage point of GDP in a crisis comparable to the Great Recession can lead to cumulative output gains of about 1.5 percentage points. Bianchi notes that implementation is key – broad based, systemic bailouts are most effective in mitigating crises, while idiosyncratic and targeted bailouts increase exposure to financial crises. Estimating fiscal redistribution between natives and refugees in Sweden for 2007—the year after a particularly large inflow of refugees from Iraq—Joakim Ruist of the University of Gothenburg finds that the Swedish public sector redistributed 1.0 percent of GDP to the refugee population. This amounts to only 0.2 percent of GDP if it is assumed that some public costs do not increase in proportion with immigration. Extrapolating to 2015, Ruist concludes that the current redistribution from Swedish natives to refugees is roughly 1.35 percent of GDP, which he interprets as suggesting that generous refugee policies are not particularly burdensome from an economic standpoint. Attempting to explain the forces behind the falling long-term real interest rates across the world, Lukasz Rachel and Thomas Smith of the Bank of England find that slowing global growth and shifts in saving and investment preferences account for about 20 percent and 70 percent, respectively, of the fall of the global neutral real rate over the past 30 years. 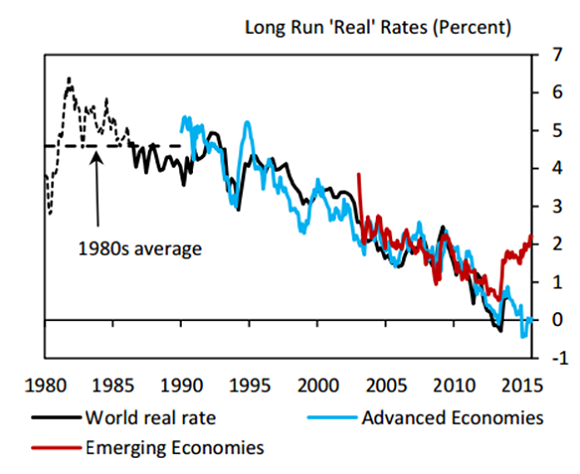 The authors believe that most of these forces will persist, suggesting that the global real rate may remain low and perhaps stay at or slightly below 1% in the medium to long run. [S]hould we be concerned about the possibility of the unemployment rate falling somewhat below its longer-run normal level, as the most recent FOMC projections suggest? In my view, a modest overshoot of this sort would be appropriate in current circumstances for two reasons. First, other measures of labor market conditions…indicate that more slack may remain in labor market than the unemployment rate alone would suggest. Second, with inflation currently well below 2 percent, a modest overshoot actually could be helpful in moving inflation back to 2 percent more rapidly. Nonetheless, a persistent large overshoot of our employment mandate would risk an undesirable rise in inflation that might require a relatively abrupt policy tightening, which could inadvertently push the economy into recession.